If you are intending to free range your new hens, keep the hens in the henhouse/coop for at least 3 to 4 days with their food and water, to ensure they come back to eat, drink, sleep and lay in the henhouse. Discourage hens from sleeping in nest boxes as they do 90% of their pooping when asleep. At 18 - 20 weeks, hens eat 120grams of layers feed per hen, per day. Feed with pellets or mash (our recommended choice). If using pellets it is best to introduce it gradually with mash. Feed scraps (vegies - they prefer cooked, rather than raw) are fine on top of the above layers feed. Introduce a bowl of oyster grit (pudding bowl size) for hens to help themselves to as it improves shell quality. Remove eggs as quickly as possible, you don’t want the hens eating the eggs – hard habit to break. Check the nest boxes a few times a day, once they start laying (about 20 weeks), and you should be able to work out when most are laying – morning, noon or evening. As your hens come into lay they will take 3 or 4 weeks to get the egg production right - big eggs, small eggs, double yolkers, strange shapes and no shells are all perfectly normal to expect when your hen starts to lay. Day old chicks will need a direct source of heat from above for the first 3 weeks. 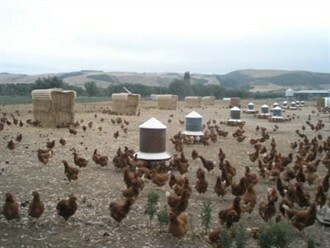 Allow an area around the edge of the rearing area for chicks to move from the heat. The area under the heat source should be warm to the touch. Birds will show you if they are too hot (moving away from the heat source) or too cold (all piling underneath), so adjust high of heat source if necessary. 100x day olds can be started off in an area of about 1mx1m. Double this area after 3 weeks, or split into 2x lots of 50. Again, double this area after 6 weeks or split into lots of 25. Start the day olds off on newspaper (first 4 or 5 days), and as well as a feed container, sprinkle feed on the paper, it moves when they walk and encourages them to eat! Dip all beaks into the water container at day old - encourages them to drink! Gradually wean from heat source at about 6 weeks. Vaccination is essential to ensure the health of any free range bird, whether you are a backyard owner or a free range egg producer. We are happy to offer advice and support to all our customers regarding the maintaining of healthy, disease free hens.